Kids India, India’s biggest B2B fair for products related to children held the exhibition for three days at Bombay Convention & Exhibition Centre in Mumbai. The event saw the key players from the industry participate with many young and innovative companies. 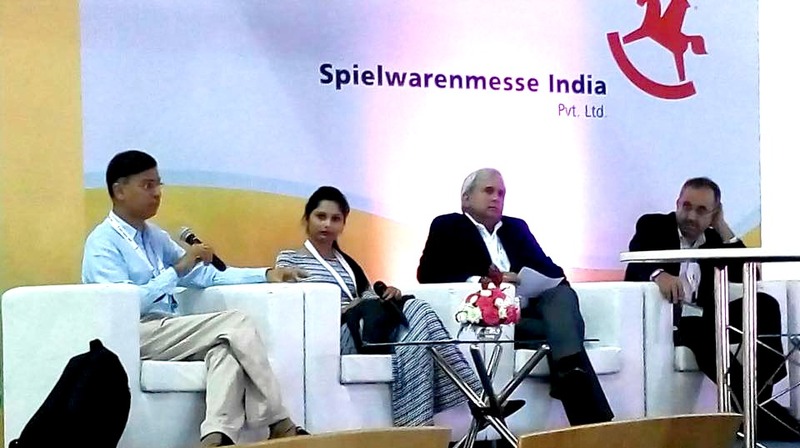 The exhibition held panel discussion on ‘Licensing in India’ on Friday focusing on the growth of licensing industry in India and how it is evolving through licensees and licensors. The issues faced by licensees and the steps which are required to take before licensing a product for good business was also highlighted in the discussion. The panel included VivekJhangiani, President, The All India Toy Manufacturer’s Association (TAITMA); RutikaMalaviya, Indian Representative, Licensing Industry Merchandisers’ Association (LIMA); S. Nagarajan, Managing Partner of En Theos Consulting, former head of Disney India and Warner Bros; and Ishmeet Singh, Country Head, Mattel Toys India Pvt. Ltd. The discussion centered on the Licensing Industry in India and things that may hinder it and the solutions to how licensees can overcome it for better businesses. Under that umbrella of licensing each panelist talked about how licensing industry is at a nascent stage but is evolving at good rate in India. “Understanding the objective of the licensees plays a role in terms of how the industry is shaping and as licensors we look out to brands which complement and enhances it,” added Singh. “The toy category is one of the major categories when it comes to licensing industry and stands at second place in terms of global retailing and India stands at 12th place out of all the categories like apparels, fashion, character licensing, etc. ”addedMalaviya. The panelist also talked about the IP laws and its relevance in the licensing industry and how each of the licensing property is needs to be protected by laws. Licensed property awareness and propensity of a category is something which needs to be checked before taking huge decisions. “In India, the licensing industry needs to grow with the support of both – licensees and licensors and LIMA as an association is always there to support the licensing industry and help the parties in need to be connected to each other through a proper platform, ” said Malaviya about the need for support and growth of Licensing Industry in India.